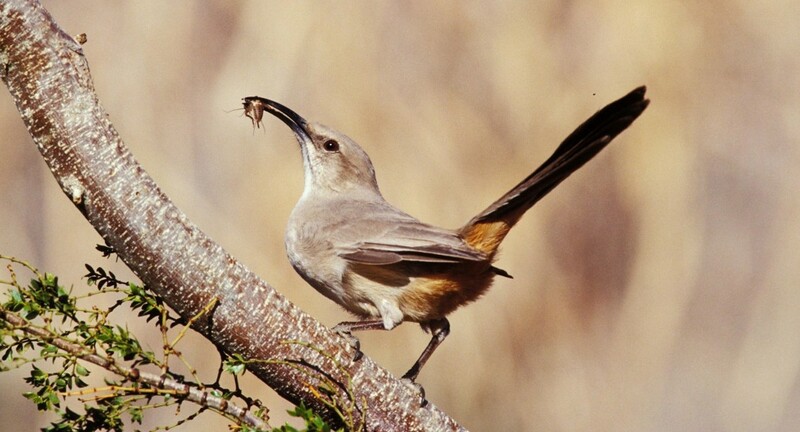 Excerpted from National Audubon's comments on the AV's Important Bird Area: The Joshua tree woodlands of the AV support one of the farthest-west populations of Le Conte's Thrasher in the state. The grassland bird community is most impressive in winter, when large numbers of raptors concentrate in the area. Large flocks of Vesper Sparrows, Horned Lark and Mountain Bluebirds also occur here. The agricultural fields, especially alfalfa, are productive year round. Winter brings Mountain Plover, whose flocks are among the last in southern California. After wet winters, nesting grassland species like Northern Harrier linger well into spring, and occasionally even breed. Swainson's Hawk maintains its southernmost breeding outpost in the state here. Large swaths of the Valley are in the path of a major spring migrant route for songbirds, agricultural windbreaks can host hundreds of vireos, thrushes and warblers during April and May. Fields that receive effluent from local water treatment facilities can support hundreds of White-faced Ibis and shorebirds, and these fields support a group of around 200 Long-billed Curlews in fall and winter. Our Antelope Valley sub-chapter meets on the second Tuesday of the month at the Prime Desert Woodland Reserve in Lancaster (35th St W and Avenue K.) We will be posting details of their meetings on our website in coming months.